Lisa Napoli: Next week, Marketplace Morning Report will be broadcasting from Cairo, Egypt. It's part of our special coverage of economic issues in the Middle East. Today, a preview. 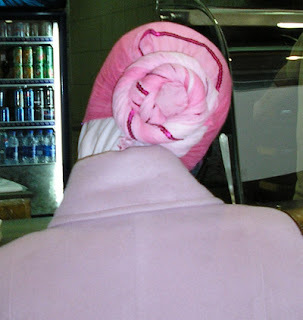 A story about one of the most iconic images of the Middle East: the head scarf. In recent years, the head scarf has been a flash point the world over. Marketplace's Alisa Roth says in Jordan, some women who wear it say it's more about fashion than religion. Alisa Roth: Standing in a shop window, Lowei is carefully wrapping a mannequin in a head scarf. As a man, he's not allowed to put the scarf directly on a real woman. He says there are a lot more hijab -- or head scarf -- stores than there used to be in Jordan. Not necessarily because people are more religious, he says, but because it's the style. That style is good for business: headscarves have to keep up with clothes fashion, Lowei explains. So if purple is the "it" color for sweaters or shirts, it'll be big for hijab, too. 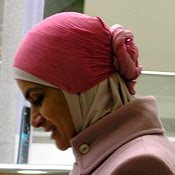 But there are more variations with headscarves, from the kind of fabric to the way it's wrapped around the head. that's exactly what my husband said already two years ago, as I (back then a "new muslim") was wondering why some women to bee seen in the TV-shows and also on the streets in his homecountry were wearing hijab in the way that let people see their foreheadhair.... it looked as if those women were more concern about how their hair looked like under the hijab, than if the hijab was covering those things, it was supposed to. The women wore the hijab because it was "cool" and "in fashion". I agree with you Jana. It is a stupid article and I think that some parts of the translation are not reliable also. I don’t really understand why some people are separating style from hijab. It is not Haram to be a stylish Muhjaba. I am not saying that you have to attract attention but to represent yourself in an appealing way is also representing Isalm in the same manner. The hijab is meant to portray modesty and simplicity. It is a covering for the woman so she may not display her beauty publicly to men other than her ma7hrams. Allah swt has made us a balanced nation, we must apply that in every aspect of our lives. In the way we dress, we must not dress raggedly and rubbishly, yet we mustn't waste money trying to adorn ourselves and beautify ourselves by conforming to westernized fashion. Interesting article, odd statment from 'Sheikh'. Anyway, I like to coil hijab. Having our head covered in a way that make us representative is NOT reducing our modesty. We live in the 21st century and we are working, highly educated women. I don’t agree that buying trendy attires are a waste of money; it is a part of the Ne’mah (gift) that’s given from Almighty Allah SWT. I also don’t approve the way some Muslim girls wearing their outfits and make up. I am discussing the idea of making the hijab a Muslim fashion statement. I'm disappointed by the Marketplace article, but perhaps it will help some Western readers to relax a little about Muslimahs and hijabis in general. Of course, the only thing that will really make westerners want to accept or even embrace the practice of hijab is if we Muslimahs show them that we are normal human beings who happen to follow more specific dress codes as a matter of personal choice, and don't have any desire to restrict them or dictate what they do (unlike evangelical Christians and the fundamental conservative right).